Rat poison isn't just killing rats. When a rat eats poison, it doesn't die immediately. 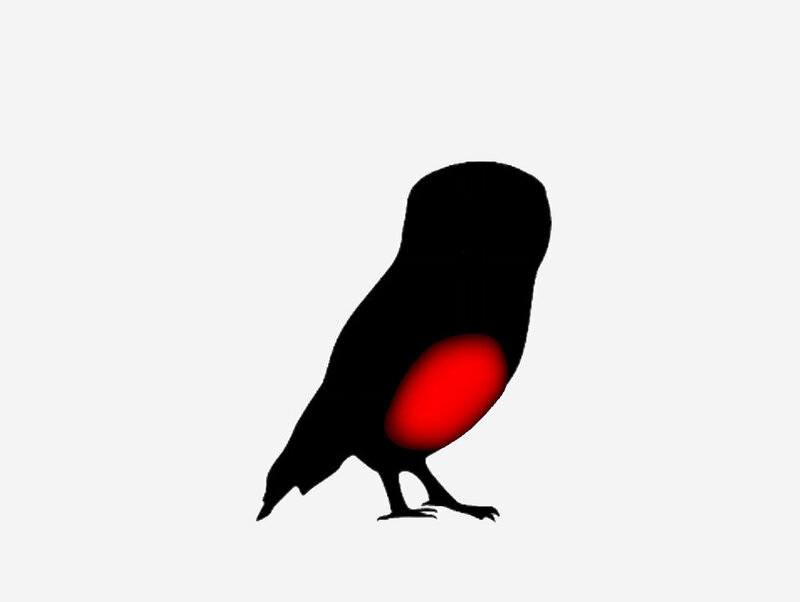 It becomes slow and sluggish, making it easy prey for nearby predators. The predator has now eaten a poisoned rat, becoming a victim of "secondary poisoning." Secondary poisoning weakens the predator, leading to an increased risk of predation, automobile collisions, and diseases such as mange. "Rosie" the coyote was rescued in Laurel Canyon and treated for rodenticide-induced mange and secondary infections. Griffith Park's "P-22" mountain lion was caught and treated for mange as a result of exposure to rat poison. This treatment may have saved his life—many animals die from the effects of mange. 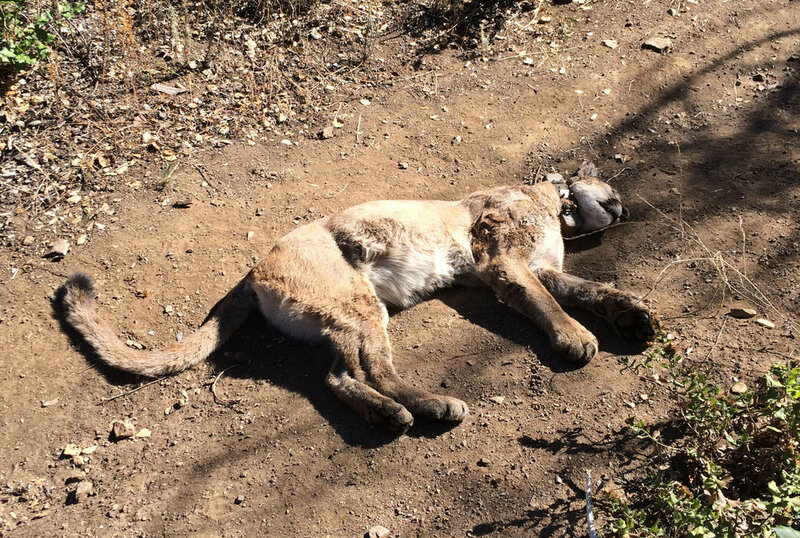 "P-34" mountain lion died in Malibu from internal bleeding. A necropsy found that she had been exposed to five different poison compounds. Of the animals tested in the Santa Monica Mountains region, a high percentage tested positive for rodenticide exposure. Percentage of animals in and around the Santa Monica Mountains with rat poison in their system. 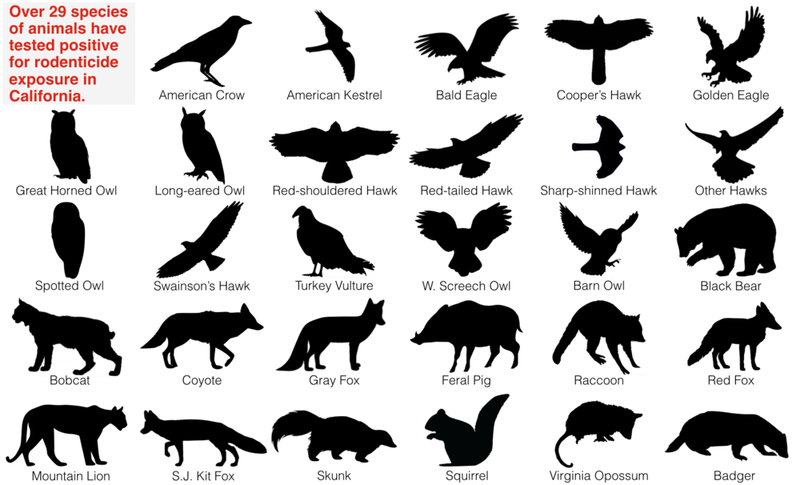 Statistics from Urban Carnivores and National Park Service. 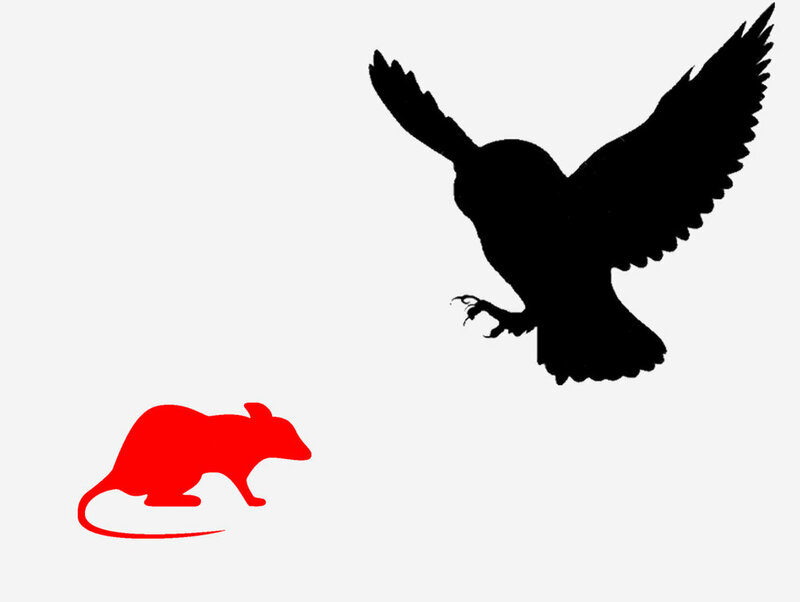 Watch our short film to learn more about rodenticides. In 2014, CLAW worked with LA City Council to successfully ban "second generation" (high toxicity) rodenticides from being used in all LA City Parks (For more info, see our formal position letter, the resulting motion, and news coverage of this important development). CLAW's Barn Owl Nesting Box Program is spreading the word about the dangers of rodenticides, while promoting a natural method of rodent control. Read CLAW's letter of support for AB 2422, which would ban all anticoagulant rodenticides in California, except for agricultural use. California Residents: Click here to use our simple form and add your voice to support AB 1788! AB 1788 is a new rodenticides bill for 2019, and is the result of a coalition of environmental advocates including CLAW. Authored by Assembly Member Richard Bloom, this bill would ban the “second generation” category of anticoagulant rodenticides in California, and the use of ANY rodenticide within California State Parks. You can read a fact sheet about this bill here. Los Angeles Residents: Contact Mayor Garcetti and your City Council Member, and tell them rodenticides of any kind should be banned in parks and sensitive areas in the City of Los Angeles. Attend your next community meeting (HOA, Residential Association, Neighborhood Council, school, religious organization or other community groups) to educate your friends and neighbors about the dangerous effects of rat poison. Ask your community to take a formal stand to abandon the use of ALL anticoagulant rodenticides with a No Rodent Poison resolution. CLAW will donate a barn owl nesting box to any community organization in Los Angeles that adopts a No Rodent Poison resolution. Tell your pest control company you do not want them to use rat poison. Seal up cracks and crevices where rats may be entering your home. Use 1/4" wire (not chicken wire) to cover holes. Do not leave pet food outside. Clean up dropped fruit or any other food that may be attracting rodents to your home. Ensure that garbage bins are secure. Remove wood piles, cardboard boxes, tires, debris, and overgrown plants where rats may be nesting. Remove tree limbs within 3 feet of roofs. If necessary, use non-toxic lethal options like electric or mechanical rat traps.